*snrk* whuh? Oh. Uh. Good morning. Can uh… can I help you? Right. Blog post. Yep… coming right up. OCTOBER 2017?? It’s been ALMOST A YEAR?? You’re alive! Oh sweet Je– (probably shouldn’t say that)– Thank you G– (probably shouldn’t say that), Oh… Secular… Hooray? Ah well. Good enough for now. Thank you all for tuning in. A year ago I churned out a good nine posts on the Bible: Genesis, Exodus, and most of Leviticus. 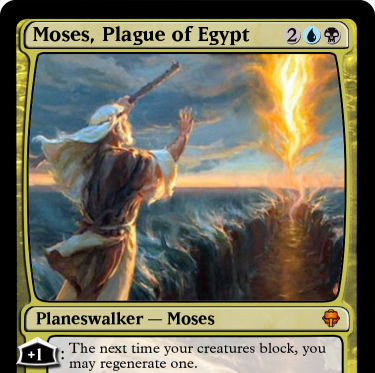 I’d been hit with this strange calling to talk about the Bible, and for some reason that meant blogging, in comedy, while geeking out by making Magic: the Gathering cards. I don’t know how much of that was God’s “putting it on my heart” to do it that way and how much of that was Him letting me pick. It was a weird feeling. It was like a mix of having a good idea, like a personal project, and like feeling you’re supposed to do it for some bigger reason. And here’s the sort-of-divine part: I stopped needing sleep. And as long as I spent almost the whole night on-topic, I could stay up two, three, even five hours, and get up in the morning like I’d got 8 hours. This is after a lifetime of desperately needing 7 hours or more, and literally bumping into walls like an 8-ball when I didn’t. And the two nights I tried just staying up and not doing the blog, that’s how I felt. I only got energy for the blog. So, late October, that’s when I heard I might lose my job. All my other priorities dropped. Job-hunting is an all-consuming fire for the brain that replaces everything else. (Which is weird, because I definitely didn’t spend 40 hours a week searching and applying when I was between jobs, but it sure felt like 40.) The jobs I had since then have not been stable. Until now. I signed a lot of non-disclosure contracts, so I won’t say what I do or where. I promise it’s not for the alt-right. As for the Bible… I… I didn’t wait for you guys. I read the whole New Testament! And it’s almost 600 pages! (It took me a year to get that far, and that’s with months of distraction throughout.) This led to plenty of Magic: the Gathering card concepts, a backlog of which I’ll get to when someone bribes or threatens me into it. As for Magic: the Gathering, there is an absurd amount of new card sets now! More of Ixalan’s Mayans with Dinosaurs, the fantastic parody card set Unstable, revisiting the decades-old storyline of Dominaria, and the kind-of-storyline-less gladiator fest of Battlebond. Oh, one other bit of news. I’ve written a book. Subscribe to the blog and you’ll get updated when it’s published! Next My First Book has been Released!